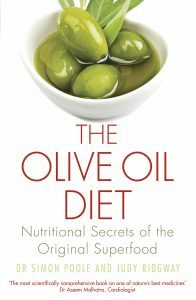 Six recipes from my book The Olive Oil Diet written with Dr. Simon Poole were featured last month on the Sydney Times website at sydneytimes.net.au Great to see our ideas down under. Lentils do not usually need to be soaked overnight but it is essential for this recipe but once that is done the falafel only take about ten minutes to prepare and cook. Serve as a first course on a bed of rocket or as part of a mixed meze. Soak the lentils in the water overnight. Start by making the Tahini sauce. Place the tahini paste in a mug or small basin and stir in the lemon juice and a little of the water. The mixture will first thicken and then start to soften into a thick cream. Keep adding water very slowly until you reach a thick but runny cream. Keep on one side until required. When you are ready to cook the falafel, drain the lentils well and transfer to a food processor. Add the onion, ginger and fresh coriander and two tablespoons of water. Process until the mixture turns to a thick paste, stopping to scrape the sides of the container down once or twice. You may have to rest the machine two or three times during this process. The mixture should have the texture of a soft paté. If it is very stiff add a little more water. Heat the olive oil in a thermostatically controlled deep fat fryer to 180˚. 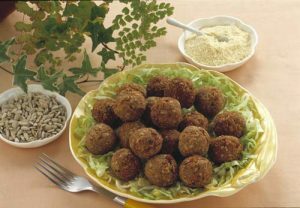 Shape the falafel paste into small flattish rounds with two tablespoons. Drop six into the fryer and cook for 2 minutes until well browned. Remove to dry on kitchen paper and cook the remaining 6 falafel. Blue cheeses go very well with a variety of vegetables to make excellent soups. 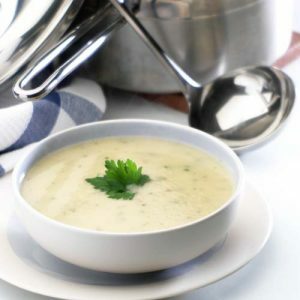 Celeriac gives a distinctive but delicate flavour to this soup.If you do not want to use cream, use yoghurt with a little potato flour creamed into to it to stop the yoghurt curdling. Heat the olive oil and gently fry the onions, celeriac and carrot for 3-4 minutes to bring out the flavours. Add the stock and pepper and bring to the boil. Cover and simmer for 20 minutes. Puree in a blender, return to the saucepan and add the cream and cheese. Carefully reheat, stirring all the time, until the cheese melts. The lovely fresh vegetables in this soup from the south of France do not need too much cooking. For the best effect keep them crunchy. Cover with water and bring to the boil. Simmer for 15 minutes. Add the macaroni and continue simmering for 10 minutes. Add all the remaining ingredients and simmer for another 5 minutes. Meanwhile, make the Pistou processing the garlic with the basil in a blender. Take care not to over process the herbs. Add half the Parmesan cheese and oil and season with black pepper. Serve the cooked soup in bowls and garnish the remaining Parmesan. Serve with the Pistou in a separate bowl on the side leaving diners to help themselves. These little parcels make a good starter to a special meal. Serve with a creamy yogurt sauce or crème fraiche and a rocket salad and pea shoot salad tossed in extra virgin olive oil vinaigrette. 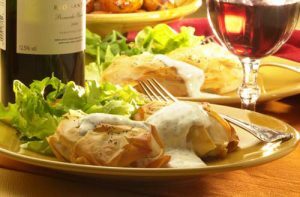 Place a sheet of filo pastry on a board and brush all over with olive oil and fold over once. Brush with more oil and fold again so that you have a square of pastry with thickness of four layers. Place a quarter of the goat’s cheese in the centre of the square and top with a heaped teaspoon of mango chutney. Gather up the corners of the square of filo pastry and press together to form a small round parcel. Brush well all over with more olive oil and pinch the pastry together at the top of the parcel. Repeat this process with three more sheets of filo pastry to make four parcels. Place in the oven and bake for 10 minutes until the parcels are lightly browned and crispy. 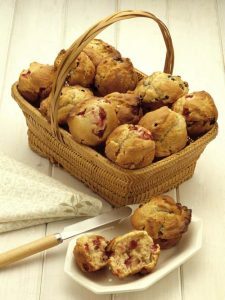 These light and fluffy muffins make a great weekend breakfast. They are very quick to make and do not need anything adding to them. They freeze well too, so store left over muffins if any in the freezer and warm up quickly in a hot oven. Set the oven to 190C/Gas 4 and lightly oil 12 muffins tins. Mix the dry ingredients and the blue berries in a bowl, crushing just a few of them with a fork. Mix the wet ingredients with a fork and pour over the dry ingredients. Mix well and spoon into the prepared muffin tins. Bake for 25 minutes until lightly browned and cooked through to the centre. To make the apricot puree for these buns soak 225g dried apricots in water overnights and cook with a three tablespoons of white wine until soft. Puree in a blender. 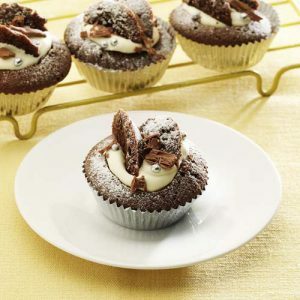 Top with whipped cream and chocolate flakes. Set the oven to 180C/Gas 4. Arrange 12 non-stick cup cases on a baking tray or oil a bun tray. Sieve the flour, cocoa powder and baking powder into a bowl. Mix the eggs, olive oil and apricot puree in another bowl. Pour the liquid mixture into the flour and mix with a wooden spoon. Add the milk to give a good dropping consistency. Spoon the mixture into the prepared bun cases or tray and bake for 15-20 minutes until cooked through. Transfer to a wire rack to cool. Store in an airtight tin and eat within three to four days or freeze to keep for longer. 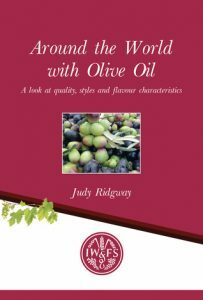 The book is available in soft back and kindle from amazon and it is also available with free worldwide distribution from the book depository.